“This is really impressive. 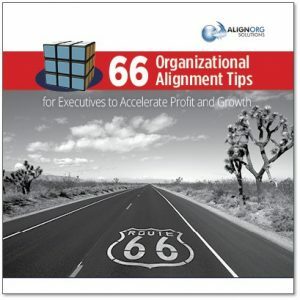 Congratulations on having created such a highly-useful tool.” –John Beeson, Beeson Consulting, Inc.
AlignOrg Solutions has pooled our knowledge of how leaders can successfully align and transform their organizations using our organizational Cube model. We use this model to diagnose an organization’s ability to deliver strategic value, to realign organization choices and to engage the organization in the process of sustainable change. Our latest book is now available in easy-to-use app format and provides our Top 66 tips for those who want to start designing a winning organization. It is organized into sections based on the six sides of the organizational Cube including the centerpiece of strategy (around which all of the other organization choices are aligned). Each side is prefaced with an explanation of the importance to alignment and transformation, followed by the tips you can implement today. You can save the app to the home screen of your mobile device to have quick access to these tips any time. Please submit your information below to receive digital access to this powerful new tool.